Editor's Comments: This story is a work in progress. Several events, such as the "Tornado" mentioned by Pete Hylton, are still being researched. John Bernadine of Tulsa is writing a book about War Bonnet, and we are colluding with him for additional information. 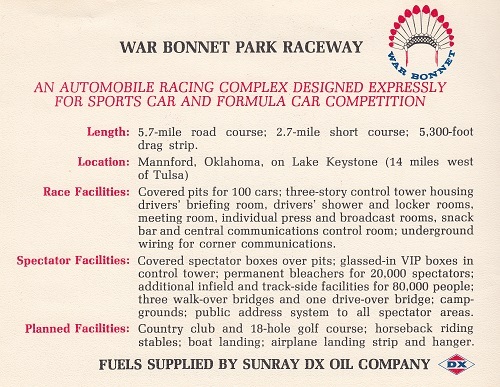 Even though War Bonnet was in NEOkla Region, it deserves a place in the Gazette because it was the first permanent circuit built in Oklahoma, and so many OK Region drivers, workers and officials participated there. Unless other wise noted, the words presented here are by Stephen England. The first mention in the Gazette of War Bonnet Park Raceway was in the April 1966 edition under "Future Gasket Blowers" calendar of events. Listed was a drivers school on July 22-24 and another on August 6 - 8 to be held by NE-Okla Region at War Bonnet Raceway, Mannford. "Plans are pretty well whipping into shape for our driver school and regional race July 22-24 at War Bonnet. The situation at War Bonnet thus far is this… Bob Moore started clearing land June 7. He realizes we are cutting it pretty close (if things keep on schedule, he will be finished eight days before the race). If time gets too short, he will develop one of the planned access roads and have a 1.1 mile circuit. At any rate, the bridge over the lake inlet is out, for now." 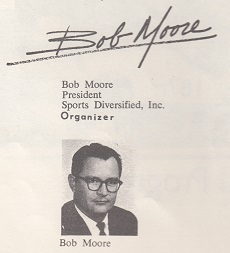 The above list of amenities and the proposed map of the track are from promotional material prepared by Bob Moore and distributed at an Oklahoma Region Membership Meeting in April or May of 1966. Obviously the changes made to finish the short track in time for the inauguaral Drivers School required changes to the long track. 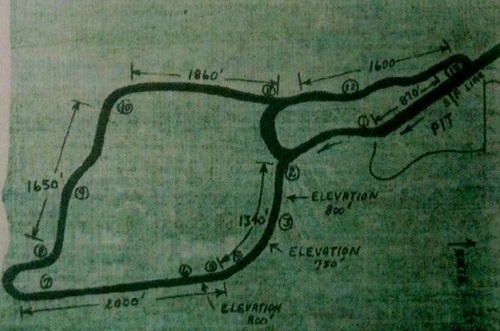 Compare this track diagram with the one provided by Mike Halley later in this article. The first time I saw Bob Moore he was "driving" the paving machine out of Turn Six (Last turn on short course) to the Start/Finish, laying the final strip of asphalt for War Bonnet's inaugural race. If ever there was a man who "made a racetrack" it was Bob. Always smiling, friendly and willing to do anything to keep the races going. 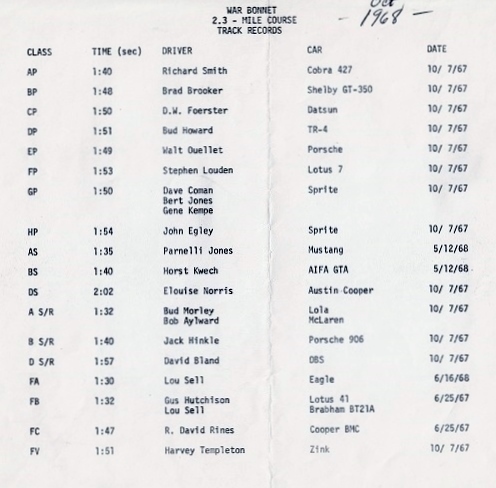 My father told the story of when the track needed some improvement and Bob simply stated he would "write a check for it." The only problem was Bob had no money to cover the check, but that never slowed him down. When the bankers finally foreclosed on Moore, he was living in the timing stand at start/finish. Bob is currently living in Sapulpa, Ok.
"Almost 1/2 of the Oklahoma Region members were present for the NE-Okla inaugural event at War Bonnet. We were represented in every phase, students, driver school instructors, flagging and communications, officials, competitors in regional race and pit crews. Between classroom instruction Friday evening and time to go to the track Saturday morning it rained. Chief concern was the effect this would have in the newly-laid asphalt. However the effect on the track was as nothing compared to the effect on the 2 miles of dirt road between the highway and the track. It was a bit rough on those towing trailers and cars but with the help of a bulldozer all made it to the track on time in good spirits. No track physician ? Small worry - our Oklahoma Region had two built-in volunteers . Our newest member, Dr. Jim Walraven, was already there attending drivers school and Dr. Bill Foerster was scheduled to arrive before noon to be an instructor. Between these two the course never lacked for a physician, although they frequently had to spell each other so Jim could practice what appears to be a truly natural aptitude for speed driving and so Bill could show thre E-F-GP boys the fast way around. In the meantime, the students and instructors walked the course and prepared for on-course practice. Soon Tom Dean was driving his TR-3, Victor Harbord his TR-4A, David Hutchinson his Sprite, Sandy Kunzer his SAAB sedan, Bob Loomis in a Cobra, and Jim Walraven an MGB, with instructors Tommy Allen, David Dooley, Bill Foerster (when Jim wasn't on the track), George Johnson, Eloise Norrris, and John Walker closely observing and riding with their students. The first flag at War Bonnet Park Raceway was dropped by David Wood, who continued as Chief Starter for the entire weekend. The drivers school races finally got there and our boys had their first chance at competition. What a thrill! And they all drove well and finished high in their respective classes. Saturday evening all were tired, dirty, and happy with the track and everything connected with it. Bob Moore is to be commended on his new course. The new asphalt did not break up nearly as bad as one would have expected and the 1.1 miles, although short, it's a fun little track with S's, a decreasing radius, high-speed bends, and a downhill turn onto the pit straight. Starting grid for the first race at Warbonnet. 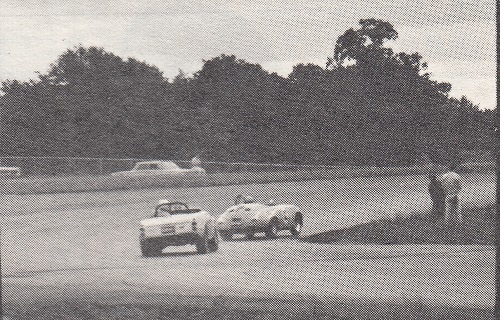 #38 VW was driven by Jimmie Lyttle, Guy McMurray is in #82 Lotus Eleven and Johnny Walker is in #17 SAAB. The races were over– a gratifying number of enthusiasts stayed to applaud the victors as they reaped the rewards (pretty trophies), and we all happily drove the few miles home. This report, however, is not over until a few well-earned bouquets are thrown. Sunray DX (also sponsoring our Sports Car Festival) had helped the NE-Okla Region with this event. Carter Maxwell brought a van for Goodyear tires, sold some tires and furnished much free air and services all weekend. 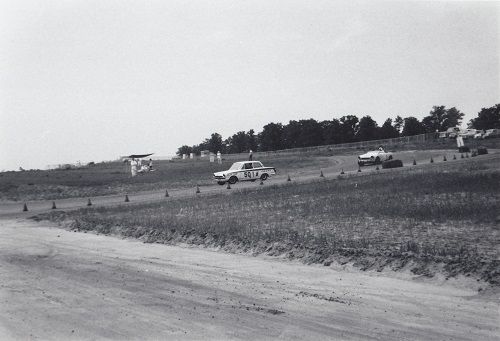 The Sunray DX service station at New Mannford furnished the wrecker which was at the track for both Drivers School and the Races. Bob Moore worked furiously (and successfully) at keeping his new track in good ration condition all weekend. Next event at War Bonnet – August 6 and 7. Already more new drivers are planning on the School, other drivers are planning on the Race and flagman are busily getting their corner crews together. Supermodifieds On A Road Course ? 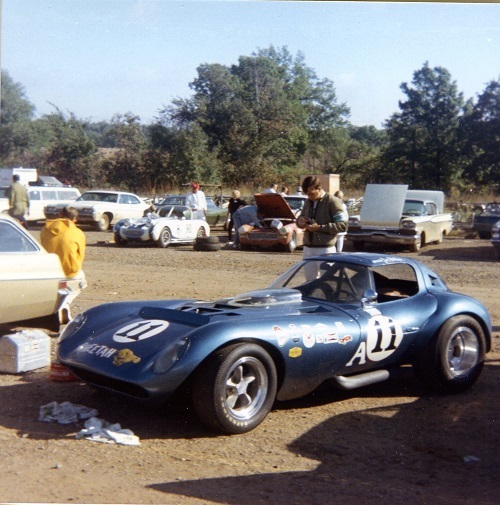 One of the most unusual race at War Bonnet was the undercard for the 1968 SCCA Formula Series when Super Modifieds, mostly from Tulsa, raced on the short track. They were loud and driven to hairy limits, but their speeds seemed slow in comparison to the Formula cars. It was a good show nonetheless. In the photo above the Super Modified take the green flag with race leaders Peter York, #1 and Buddy Cagle, #52, already ahead of the field. Below York and Cagle are dicing for the lead. York won. Photos courtesy Jimmie Grimm. Javelin fourth. However the race was halted when a Mustang spun off and hit a car in a spectator area, sending two children to the hospital. Racing ended soon after that due to lack of attendance and concern over safety issues. Being in tornado alley it's not surprising that bad weather could hit War Bonnet. Long time workers talk of the time that a tornado blew the timers and scorers off the flatbed trailer where they worked at portable tables and chairs. Today the circuit has been turned into public roads for a housing addition and a trailer court. The roads are broken and filled with potholes in many places and the section that comprised the crossover to convert from the long course to the short course is gravel and dirt. Enough remains to leave impressions this would've been a fast, fun course and the trees, embankments, culverts and narrow bridges would have made it frightening by today's standards. 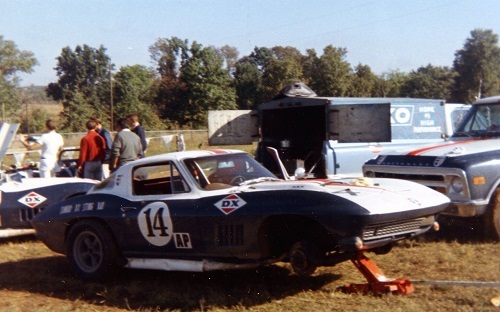 The Sunray DX L-88 Corvettes in the pits, October, 1969. Photo John Hansford. Pete Hylton said declining attendance closed War Bonnet, which may be true, but I believe Sunray DX pulling out of motorsports when they were bought by SUNOCO was the straw that broke the camels back. Sunray DX needed a " home track" and Bob couldn't survive without some corporate assistance. 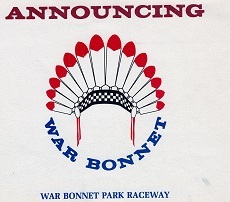 The last race at War Bonnet was a National Race in October 1969. The following year brought increased safety requirements and Oklahoma lost Ponca City for one year, and War Bonnet for ever. Chet Johnson preps the brand new Lola (still in gel-coat) of Jack Hinkle. October, 1969 photo by John Hansford. Also new to War Bonnet in 1969 was this Cheetah, driver unknown. Photo by John Hansford. 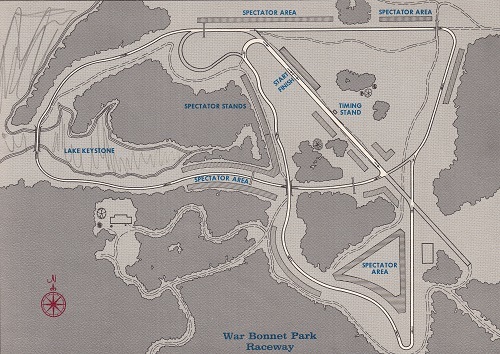 The course diagram below was "found" by Mike Halley hanging on the wall of the City of Mannford's Activity Center. It is fairly correct except for the "kink" between corner stations 9 and 10. Captions for photographs in this article that have a number in parentheses correspond to the numbered corner stations on this diagram. 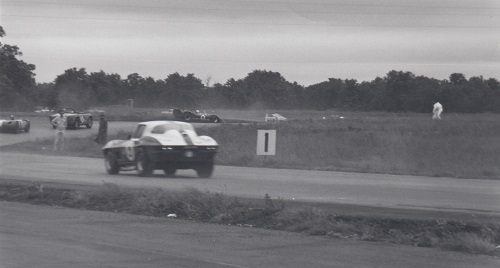 (7) Dave Dooley, Mustang # 3, dives inside John McComb's Mustang in the South hairpin on the long course, 1967. (8) The 1967 Mustang battle continues with Dooley in the lead. 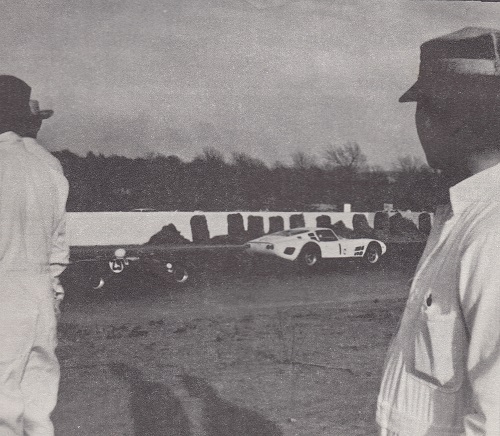 The flagman in the background is at Turn Ten. In 1971 Tom Parker wrote this farewell to War Bonnet for the Gazette. For everyone there is a place that always brings back fond memories. For me War Bonnet raceway will always be a source of happiness and sorrow because that is the place where I "got involved". As though it were yesterday, I can remember the first regional races that were held there. Out of the scrub brush and stunted oaks someone had seen fit to lay down a strip of asphalt with a few curves and a timing tower and called it a race track. There were no spectator conveniences, the entrance road was nothing to write home about, but we were there just the same. 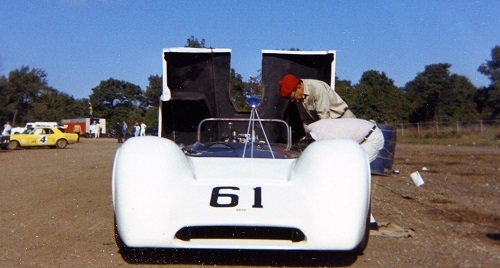 The papers had carried small write ups which mentioned that the Chaparral Chevrolet and the Ferraris would be there; they weren't but we really were not disappointed. The whine and howl all of the small bore machines was like soothing music to our enthusiastic ears! I can close my eyes and still plainly see the red Datsun in turn three, locking up the right front wheel and the blue smoke being whipped into his slipstream; the blue Cobra as it managed to plow off the course and fill it's oil radiator intake with dirt; The LeGrand Alfas who's team had driven across the country in 48 hours just to make the race, win almost easily. The road will still be mud and gravel when time ends, just as it was for the Trans-Am. We grinned and beared it and were greatly rewarded for our patience as Mark Donohue and that blue Camaro demonstrated their winning ways. As much as we like it the press hated it! All they could say was that they did not like the access road, while scarcely mentioning the race. Tulsa's paper even had the gall to print, in large black letters, "Pan-Am Race"! They dwelled on the mighty Parnelli Jones and gave precious little time to the winner, Donohue. Memories of races and slaloms at War Bonnet are just that, memories. Deep ditches cross the entrances; no trespassing signs and tall weeds are everywhere. Not long ago, I walked the main straight once again and it was like visiting an old friend for the last time. Standing on the start/finish line, I look at the torn, weatherbeaten timing tower; it's screens are ripped, some of the shutters are just hanging by one hinge or missing; the black-and-white checkered paint is slowly fading into nonexistent. Where racecars once roared and whined, there is only silence; where people worked furiously on their racing machines, only three foot tall weeds serve as a monument. As I walked around the course, I can still remember the good line to follow, just as I had practiced in the Z-28 just two years ago; down the staight, very close to the wall, twitch the car to the right, long gentle bend to the left onto the long course, very fast downhill, four-wheel drift up the other side at 110 mph, shift to fourth for the downhill straight, brake hard at the 200 marker, down to first for the hairpin, shift to second, turn left, shift to third, turn right and shift into fourth, see the tach rise to 6500 rpm before the right turn onto the bridge, experience the weightless sensation as the car tops the bump right after the bridge, long left turn out onto the short course, right, blind left, brake hard for the entrance to the hairpin, down to first with the power on hard, slide out just short of the wall and hit second just under that start/finish banner; how vividly it all comes back! One cannot help but think "IF". What I could do if I just had the money; for now, it appears that all you or I can do is remember the good times as we drive by. Editor's comments: The lap record for DS, Eloise Norris is obviously in error. I believe it should be 1:52. There is no record for C Sedan even though two time National Champion Richard McDaniel drove his "Purple People Eater" Overseas Motors Mini in the 1968 TransAm under two liter class.